Iguana pets are really exciting animals to own, but there are some important things to consider before you decide to bring one home. First, they require a very specific living environment. They are tropical by origin and require constant tropical conditions. The temperature of their living area must remain consistent, regardless of the temperature outside. If there is snow on the ground, your iguana enclosure still needs to maintain the proper tropical temperature. Iguana pets need an enclosure at least 1.5 to 2 times their length. That may not seem like much when you are looking at a baby hatchling iguana, but they grow. They grow big. Iguanas grow about 12 inches per year and reach lengths that vary from 5 to 7 feet long. You don't have to provide an iguana cage or enclosure; you can have a "free roaming" iguana. That does not necessarily mean you give your iguana full run of your home. You can still restrict him to a specific room or area; it just isn't enclosed like an iguana cage. There are many things to consider before you decide to allow your iguana to roam freely. Iguanas like to climb. They are arboreal lizards in their natural habitat, which means they live in trees. They prefer to be up high so they can see what is going on below them. In the wild, this helps protect them because they can see predators and danger below. Iguanas like to bask and sleep in elevated areas approximately 4 to 7 feet above ground level. This is accomplished by creating iguana "shelves" or adding "branches" to their iguana cages. These basking accommodations need to be sturdy so they can sustain the iguana's weight. As your iguana grows, you may have to adjust your basking shelves and branches. You will need to provide lighting and heating equipment for your iguana. Iguanas have specific lighting requirements for different times of the day. As your iguana grows and increases in size, the lighting and heating equipment may require adjusting to accommodate him. Iguanas are herbivores and have particular dietary requirements. Don't assume because your iguana is an herbivore that you can just feed him iceberg lettuce and be done with it. Iceberg lettuce does not contain the required nutrients for your iguana. There are very specific foods that your iguana needs to eat and in certain proportions. There are also some very specific foods you should never feed your iguana. If you have heard the rumor that you should feed your iguana insects, mice, and worms, listen up. It is just a rumor, and it is totally wrong. While iguanas do require protein, it is plant protein, NOT animal protein. Iguanas may eat insects occasionally on their own, but you should stick to the required diet and refrain from feeding your animal the wrong foods. Your iguana might accept food from you from your plate, but that does not mean it is good for him. Learn proper iguana foods early on, and stick to a proper diet plan. If you want to own an iguana, it is a lot of fun. They are very interesting creatures to observe. If you properly train and care for your iguana, he will be happy and healthy for years to come. Just be prepared in advance for the commitment iguana ownership requires. The iguana will need special lighting and heating equipment; a properly structured and furnished enclosure; a very specific diet; proper training; and attention from you. Know what you are getting involved in up front. A well-informed decision is always best so that you are fully prepared for your iguana adventure. If this is the first time that you'll be caring for an iguana, then it's probably best to acquaint yourself with the anatomy and basic behaviors of an iguana. By educating yourself, it will be easier to tell when there's something wrong with your new pet reptile. These are a few basic iguana facts you should know. Iguanas are reptiles and, therefore, they need a consistent supply of heat and Ultra violet rays to stay healthy. Iguanas won't be able to function in habitat with a temperature which is lower than 79 degrees. Ultra violet rays are necessary so the iguana is able to metabolize calcium and other minerals. Without Ultra violet rays, your iguana will probably experience bone mineral disorders that frequently result in their death. Iguanas can seem to be threatened fairly easily, and when you don't observe their mannerisms and behavior closely enough you may get bitten or hit by its massive tail. Unlike cats and dogs, iguanas will not vocalize a lot before biting, so be careful particularly if the iguana hasn't been fully tamed. When you first bring your new pet home do not over handle him or overexpose him to strangers. It will take a few weeks to gradually acclimate him to his new environment. Once he is comfortable in his new surrounding, begin to socialize him gradually and the bonding process will go much better. The dewlap, or the large wad of skin beneath the iguana's jowls, is additionally used to communicate. In the wild, an iguana may raise its head to extend the dewlap to signal a basic "Hello" to members of its own species. An extended dewlap may also mean that it is attempting to protect its territory from the human owner or from other iguanas. During mating season an extended dewlap may mean "I desire to mate". This only applies should there be female iguanas in the same enclosure, and it's mating season. If your iguana has been tamed, and is used to your presence, an extended dewlap may signify it is just a little drafty and it's making an attempt to make itself feel warmer. Head Bobbing: I am the man of the house? Head Bobbing: (to owner) "Howdy Mate!" Head Bobbing: (fast, laterally then up and down) I'm threatened do not go near me! Tongue Flicking: Just exploring the air. Possibly eating something. Tongue Flicking: I'm about to take a bite from something. Sneezing: I'm purging my system of something. Tail Whipping: I'm planning to attack.? Squirming Around: I do not like being held. Head and Front Legs Stretching: I feel great and I feel good! Just like other reptiles, your iguana has a set of eyes that have evolved to scan the environment for food and potential predators. It has a pair of ears that are protected by a fairly wide element of skin called the subtympanic shield. The iguana also forms spines along its back; these pliable spines are called the caudal spines and, as time passes, these grow in length and become harder. Iguanas also have a flap of skin under their lower jaw known as the dewlap. Iguanas are herbivorous (they are nourished by plants only), so they are equipped with small, yet very sharp, teeth that are designed to tear apart fibrous plant matter. Be cautious when bringing your hands near the iguana's mouth, because those teeth can cause serious tears in your skin. If you look closely at the top of the iguana's head, you will observe a prominent, light patch of scale. This is called the parietal eye, or third eye. 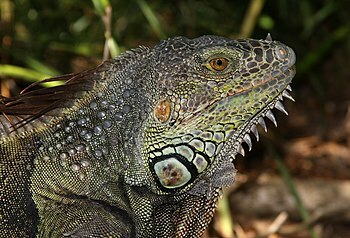 The iguana uses its third eye to detect changes in light in a given area. It is thought this primordial eye is also used to detect flying predators, hence the iguana can make a run for cover before becoming another animal's lunch or dinner. It is essential to learn about iguana behavior and mannerisms. The basic facts discussed in the article should help to decipher your iguana's moods. Don't forget that no two iguanas are exactly alike so you must also learn the personality of your new pet. Ask questions and gather as much information as possible to ensure that your iguana is long lived well cared for. Sam Boothe has been keeping reptiles since childhood. 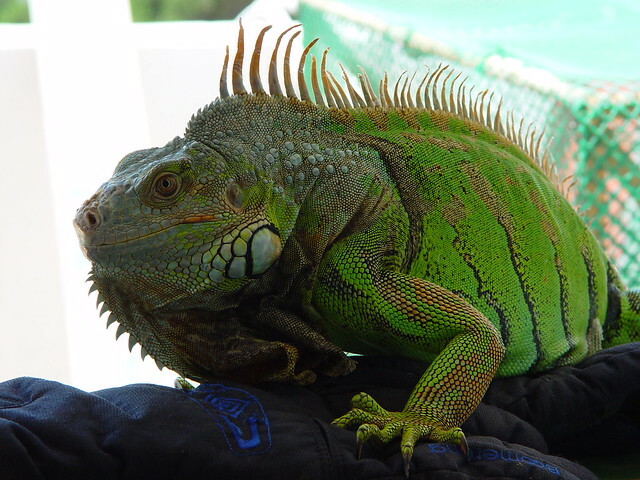 Learn more about iguanas and iguana care at http://iguanacare-site.com to ensure your new pet lives a long and happy life.